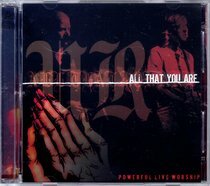 ALL THAT YOU ARE is an exciting, innovative worship album/DVD from emerging artist Daniel Shuker. Capturing the passion of live worship, this album was recorded over two nights at the Gateway Church, with youth from all over Brisbane. Calling us to a deeper relationship with God, the album features non-stop worship from beginning to end ' from the power ballad 'God, My Friend' to the intimate 'Humble'. Featured artists include James Aiton (Gateway Church) and Karolina Gunsser (CitiPointe Church). About "All That You Are"